In This Episode: Some know their life’s purpose and mission. Others don’t know how to apply them to their lives. Here’s how to get clarity on both, even if you’re retired. I mention my wife. Her web site is LiveInFocusedEnergy.com. Star Trek: The Next Generation Executive Producer Michael Piller, who was also EP (and co-creator) for Star Trek: Deep Space 9, died several years later — in 2005, at 57 — from head and neck cancer. Do you know your Purpose in life? A clear understanding of the core of who you are, your essence as a human being? Or a Mission that will guide what you do in each phase of your life that serves your Purpose? Most of us had some sort of dream as a child, but most of us end up doing what’s expedient to make a living. No matter how old you are, you can still align to your Purpose, and this episode explores one way to make your path crystal clear. A few lucky people seem to be born with a clear and compelling Purpose in their lives, and work their Mission to fulfill that Purpose every day. Yet most of us flounder most of the time. And if we do figure out our Purpose, it often feels like it’s “too late”: we’re already busy with a job, a partner, a family — you know, a life! It might seem like your Purpose in life is to work long hours, not get paid enough, come home and try to catch up with cooking, cleaning, and laundry, fall into bed exhausted, and then catch up with email on your phone when you wake up in the middle of the night. And start over again the next day. Weekends? That’s when you catch up with the cooking, cleaning, and laundry you didn’t get done during the week. Doesn’t that seem to describe most people? Almost everyone struggles with this! But a few don’t. So how do they do it? The ones who seem to have it all together, with a clear path in life. We all know, or at least know of, people like that. Are they gifted in a way we are not? I don’t think so. I really do believe it’s a matter of (yeah) Uncommon Sense. Some treat the words Purpose and Mission as the same thing. I don’t, so let’s define our terms. To me, “Purpose” is the core of who we are, your fundamental identity that drives what you do. Purpose may become more focused over time, but it’s generally unchanging. A “Mission” is an ambition, the specific goals and actions that guide your day-to-day work in a way that serves your Purpose. Missions can change: if you reach a goal, satisfying your Mission, you may start an entirely new one. For a quick example, consider NASA: their Purpose is to pioneer the future in space exploration, scientific discovery, and aeronautics research to not just serve our country, but humanity as a whole. And they’ve certainly provided good examples of that with a variety of Missions. They even call their projects “Missions” — like the presidentially designated ambition to land men on the moon and return them back home safely. Or, to explore deep space to learn the origins of the solar system, the universe, our planet, and ourselves. Or even just helping us fly from place to place more easily and efficiently. So back to individuals. Some people got a message at some point in their life that there is something they want to accomplish — what they want to fight for, who they want to serve, what they want to do: their Mission. They might even know why: their Purpose, or how that Mission serves who they are. Some figure this out when they’re quite young. Others only when they retire from their careers, and have enough money saved that the risk of doing what they really want is minimized. Your Purpose is always there, even if it’s not well defined, even if you’ve never thought about it. Even then, it may call to us softly — call it a yearning. When you have that, you have the choice of listening to that quiet urging from within, or saying “Hey: I’ve got a job. I have kids. I have responsibilities!” and consciously pushing that voice away. But then another question nags: are you pushing away a foolish dream, or your life’s Purpose? It can be really hard to answer that question. Here’s one way to get that answer: consider who needs you. Who is suffering from your not listening to that inner voice? Is there a need to get started? If the answer to that is yes, consider who it is you’re letting down by not getting started — those people who need you. Who you’re letting down. Or there’s that sigh as you think, “I wish I was doing something else.” That’s a message that maybe you’re not on Purpose — the path you want to be on that truly reflects who you are in a very basic sense. Yes, it’s scary to consider this stuff, especially if you’re in a career that doesn’t feel quite right. And when you’re there, it’s really hard to make a change. I know because I did it: I had a terrific career going at NASA that really interested me, and was even part of multiple Missions to push humanity forward. What could be more fulfilling than that?! Yet there was that yearning, that inner voice. Maybe I was letting others down, people who needed me. Well, for that one, I rationalized “probably not” — that wasn’t a driver for me. But this was: I knew I was letting myself down, because I had a dream since childhood, a self identity that I have no idea where it came from, but I knew my identity, the core of who I am, was a writer, and I knew that from a very young age, so young that I didn’t even realize at the time that it could be a career, a way to make a living. And by the way, I found out later that I greatly underestimated the impact that I could have on others. Now, I talk about my journey not because I think I did it perfectly (I didn’t), or that I think you might want to follow my path (very unlikely). Rather, it’s simply a story I know well, and I know the struggles involved — the inner turmoil, the fear of letting go of a great job to instead do something completely unknown, to show it can be done, even though it’s scary stuff! But as they say, if you’re not scared, you’re probably not pushing yourself hard enough. So I talked about those fears with a therapist. It wasn’t that I was depressed or had a mental problem, but another word for therapist is counselor, and that I needed: it was a struggle to decide what to do, so I sought counsel. At 50 minutes a week, it took a couple of months to fully lay it out to Deborah, a masters-educated therapist in Southern California, about what it is I really wanted to do. Some of it was coming from frustration: I had worked really hard in my day job to support my then-wife who was in graduate school. Our “deal” was, I’d support her while she got two Master’s degrees — in Economics and in Business Administration — and then she would be able to get a high-paying job in her field of interest, and it would be “my turn” to pursue my dream as a writer. But… she got her degrees and split. She reneged on “the deal” — I never got “my turn.” OK, too bad, so sad: now what?! The plan wasn’t going to right itself, so I needed to come up with a new plan. If I was to live my Purpose and my Mission, I had to do it myself, without a wife backing me up, and I would have to be successful or I could lose everything. Meanwhile, it wasn’t like I was stuck in a crappy job: I was advancing rapidly at NASA’s Jet Propulsion Laboratory even though I didn’t have a science degree — and they were willing to pay for me to go to graduate school, for just about any degree I wanted! Some of my work was tangential to writing: I started with tech publishing, first to produce a manual for scientists proposing experiments on the space station, then to communicate some of the basic research JPL was doing, and while I was figuring all of this out, I was splitting my time between working on a mission to Pluto, and software engineering. My job had a lot of interesting variety, but it wasn’t really writing, where I got to go into the ideas I wanted to explore. Since I wasn’t really a writer, I wasn’t living within my Purpose, so it’s not surprising that I turned to someone else for help in deciding whether, and how, to change that. Most people don’t do that: there’s an undeserved stigma about asking for help. Yet there’s a reason there are therapists, coaches, counselors, psychologists, and psychiatrists who work with people who aren’t mentally ill. Being a human — or, at least, one that’s fully engaged in striving to be their best and live their Purpose — can be really hard work, especially after realizing you’re on the wrong path. So Deborah listened to my story, guided me to fully explore what it was that I really wanted, and finally gave me her conclusion: what I wanted was indeed rational, and the only thing that was in the way was, I just had a hard decision ahead of me: do I quit my really good job and pursue my dream, or not? And with that, we parted ways. No decision made. It seemed at the time to be a waste, but it wasn’t, and I’ll explain why. Of course, the easy decision would be to stay in my interesting, fun, and rewarding job. No one was going to be able to decide for me. Yet as I pondered it, I realized “being a writer” wasn’t enough, even though I knew that was the core of who I was — my Purpose. The reason I struggled was, I didn’t know what it was I would write about. I didn’t know my Mission. When I sold the house my wife and I bought, I moved closer to work. That would eliminate two-plus hours a day of commuting in Los Angeles traffic. What did I do with that time? I journaled to help figure out my Mission. How did I see my future? What did I need to do to get there? Education or training? Accomplish various other steps first? I wrote it all down to help get clarity. Some things I came up with were things I definitely didn’t want, and that really helped too. The question was, what was my Mission? If it’s simply to write, there are an awful lot of opportunities. So I toyed with screenwriting — hey, I lived in L.A.! — and I got a big break early on: in my spare time I wrote an episode of Star Trek: The Next Generation, managed to land a pretty well-known agent, and he submitted my script to Paramount. And you know what? The executive producers liked it enough that they called me in to interview. That’s the first step to getting a high-paying writing assignment, and maybe even a staff writing job. My agent told me that I needed to come up with 3-5 story ideas that could work for the TV show, and pitch them to the executive producer. To help prepare, the studio sent me the show’s “Bible” — the requirements for how each episode would serve the vision of the series. They sent me a summary of every episode, including several that hadn’t been filmed yet (and let me tell you, that was exciting for a fan of the show!) And more. When the day arrived, it was a pretty giddy feeling to pull up at the studio gate and having the guard find my name on “The List” and let me in. I thought I was on my way when I sat down with Executive Producer Michael Piller and several of the staff writers to pitch the ideas I brought. But you know what? The entire environment felt like a creative black hole — an anti-creative atmosphere. It wasn’t the people: I liked them just fine. Piller complimented my work — the script I had submitted before even seeing the show’s Bible, the writer’s guidelines. It was an inventive story, but it didn’t feature the main cast. It couldn’t, because my story was about a classic Star Trek scenario: a junior “red shirt” officer that necessarily had to die, and of course I couldn’t kill off a prime character! So my script was rejected, but that was OK: I knew that going in. It was in the meeting that I learned why — that the main characters had to be the ones to overcome the crisis. But the black hole of anti-creative energy was just overwhelming. I could hardly wait to leave, and I was actually relieved that they didn’t make me a job offer. I was amazed that there were people who could thrive in that environment, and a lot of good stories did make it to production. So it was still a win for me: I learned that screenwriting wasn’t for me; it wasn’t just to be a writer: that was my Purpose, not my Mission. So, what, then? Back to journaling, and what emerged was that I wanted to work for myself — to also be the publisher, rather than work for a big production company or a publishing house. And, I realized I wanted out of Los Angeles. That’s when I set my sights on Colorado, but I wasn’t confident in making the move until I figured out what the heck is a Mission that I could get behind. I believe it was because of all that thinking over the course of a year that my brain worked on defining what I really wanted my Mission to be — and it did it subconsciously. Writing for Star Trek seemed awfully cool, but that wasn’t it: that’s a job, not a Mission. And then one night I sat bolt upright in bed when it all came together. My brain had figured it out, right down to the technology I needed from this new thing called the Internet, even the details of how I would lay out each story of what became This is True, and even how long it would take before I could quit my Day Job and write and publish full time. All that detail is what made it clear my brain had been working on it all along, starting with my counseling sessions with Deborah. And it worked out beautifully. I’m not rich, but I think living where I want, and having the lifestyle I envisioned, is in some ways worth more: don’t you know people who make good money, but are miserable? Maybe that even describes you. I was determined that it wouldn’t describe me. Oh, and the funny part of the story? At the end of the two years of working both jobs, at JPL and This is True, I went back to the neighborhood where I had lived with my first wife to eat at my favorite restaurant there one last time …and just happened to run into Deborah. I told her that I had figured out my Mission, and how it served my Purpose. I had executed a two-year transition plan, and was about to leave my Day Job and move to Colorado to write and publish full time. Thanks to taking the time to get the clarity I needed to figure out my Mission, and figuring out what I didn’t want to do, my path was now downright obvious to me. She was astounded: she said that in her years of counseling, none of her clients had ever actually worked to fulfill their Purpose when they realized they were on the wrong path, to let go of their current life and start over with what they really wanted to do. Which truly is a sad thing! So what’s the lesson here? What can you take away from this? First, you need to know what’s the core of who you are. It’s not necessarily what you do — that can be wildly different. If you lost that job tomorrow, you wouldn’t lose your Purpose, so what is that? Then: does what you’ve been doing for a living serve that Purpose? If it does, it’s probably really fulfilling work. And if it doesn’t, and your work is a drudge or a bore, you have to decide: can you make a change so that your work can be fulfilling? That’s the scary part, isn’t it?! Don’t let that hold you back: the whole idea is to make sure what you do, your Mission, is in line with your Purpose, because that’s the way to be truly satisfied with what you do for a living. Since my Purpose has clearly always been be a writer, then no wonder I wasn’t really fulfilled by even an interesting job at one of the coolest places on Earth! And once I realized that, what I needed was time to think that through. What could I do to free up more time? I sold the house my wife and I had bought near the university she went to so I could move closer to work. Since I was commuting two-plus hours a day to get to JPL and back, moving provided a lot more time in my day. There is another fairly easy way to get more time. According to Nielsen, who compiles the TV ratings, in 2018 they compiled their data from the previous year and found American adults spend an average of five hours and four minutes watching TV — every day, seven days a week. That’s 35 and a half hours a week, or just short of the time they spend at work. That’s 77 24-hour days a year. Mind-boggling, isn’t it? And that doesn’t even count online time! That’s right, TV time is only that low because of the additional time we spend online! See why I was able to do two full-time jobs for two years? It was just a matter of dropping commuting and almost all TV, and I could do both jobs for two years! OK, let’s summarize. One: figure out the core of who you are: what really moves you — your Purpose. Do you already have a Mission in life? Is it in line with your Purpose? Two: write things down so you can sort through it all. Test some scenarios. Sorting through conflicting emotions, ideas, goals, and scenarios to give you the clarity you need to sort through your options. Then three: come up with a plan to execute that decision. I did it by literally writing a business plan for how This is True would work, with a timetable and steps to take, which included moving to Colorado so I wouldn’t be tempted to go back to JPL if I ran into difficulties, which of course I did. And not being close enough to go back to JPL forced me to think my way out of them, which of course I did. Those professionals are there because what they offer helps. Not every one will do it for you, so if one doesn’t resonate, try another. And another and another if you need to. You work five days a week for someone else. How much time do you put in to work on yourself? Most people who do this aren’t smarter or better than you, they just spent the time to work on what it is they really want that’s in line with their Purpose in life, and what they need to do to get there. That’s it! Even if it takes a year, like it did for me, it’s a lot better than taking your entire life and saying “I wish I had gone for it” — on your deathbed! I can’t tell you your Purpose or your Mission, but that really is the easy part: it doesn’t take much time with a therapist to understand who you really are, what you really want. Maybe your Mission will be that easy too, but if you’re struggling to find it, you need space — otherwise known as time, which is probably easier to free up than you thought — and getting clarity by thinking through what it is you really want to do that serves your Purpose, and how you might get there. Writing it all down really helps. When I was done with my journaling, it was a mess with crossed-out pages and ideas, but… what was left was not just a decision, it was a map of an entirely new career that’s been hugely satisfying. And once that decision was made, I destroyed that journal — but I kept the business plan! And that, at least, is one Uncommon Sense approach to clarifying your Purpose in life, and once you know that, it’s much easier to figure out your Mission. And it really is “uncommon” because so few people actually do this, even when they do get outside help, as Deborah admitted. But I’m here to tell you, it sure beats drudging along in even a good job, “wishing” you were someplace else. As a bit of a P.S. : it snowed on and off all day here at my house in Colorado. 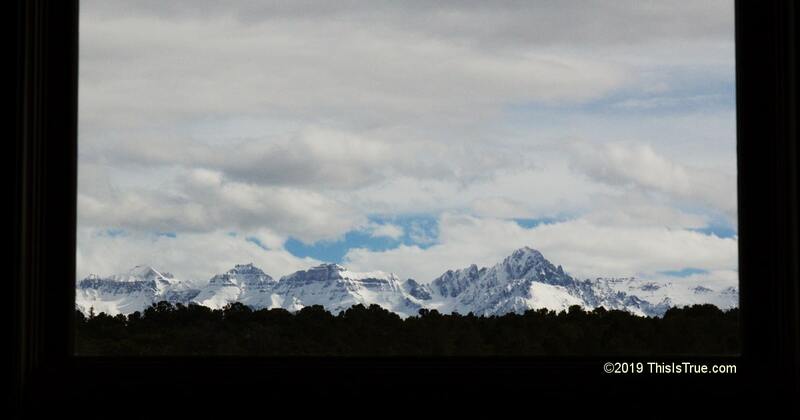 And as I was finishing up this recording, I looked up to see the clouds had lifted to give me a great view of the snow-covered mountains. What perfection: after exploring clarity, my view cleared up too! I grabbed my camera and took a photo of what I’m seeing out my window, right in front of me, right now. And yes, I’ll edit out the pause I did during recording to take it. I’ll put it on this episode’s Show Page, thisistrue.com/podcast25, to illustrate just one part of what I meant by having the lifestyle I wanted. And while you’re there, you can leave a comment. Previous Post: Which Humans Have No Worth? What a fabulous view! How fortunate you are to have been able and willing to pursue your dream and live your best life. I want to second Randy’s recommendation to find a counselor / consultant / coach / therapist with whom to discuss your purpose and mission. In 2001, I knew I was not living my purpose as my little company had been purchased by a big company and I was miserable — I was no longer proud of what I was doing for a living even though I was making oodles of money. However, by not carefully selecting a mission, I jumped from the frying pan into the fire. After eight years trying to keep up teaching high school (too much work and just not a good fit for me), I extricated myself and found a counselor. It took a couple of years to figure out what went wrong and to more clearly define my purpose and search for a mission. In late 2012, I started my new mission and life has never been better. Find someone to help you, it can save your life!